Starting on May 1, people from 59 countries can enjoy 30-day visa-free stays in south China's Hainan Province, the youngest province in the country. This new policy is among a slew of substantial policies unveiled by the Central Government to deepen the reform and opening-up process in the province and the country as a whole. Since 2010, group visitors from 26 countries could enjoy either 15-day or 21-day visa waiver treatment by booking through travel agencies. The new policy will give greater access to the island province, which boasts sandy beaches, coconut trees, plenty of sunshine and tropical scenery. Established in 1988 as a province and a Special Economic Zone (SEZ), Hainan was born with special blood. As the only tropical province in China, it developed in the past three decades from a poor fishing and farming area into a vigorous international center for tourism and green agriculture by making full use of its geographic advantages, natural resources and folk culture. The reform and opening up pace never slowed down on the island and will, in fact, only speed up in the future. Hainan is set to become a free trade zone and will gradually become a free trade port, which represents the highest level of opening up, as described by President Xi Jinping during an event marking the 30th anniversary of the establishment of the Hainan SEZ on April 13. The following day, the Central Committee of the Communist Party of China (CPC) and the State Council released a joint document setting the timetable for further opening up in Hainan. The goal is to establish a free trade system in the province by 2025 and develop the free port system to a higher level by 2035. "Hainan has the advantage of being the gateway to ASEAN countries. It should be a pioneer in opening up," said Xi, adding that SEZs in China should be more vigorous in opening up and make good use of the new opportunities. 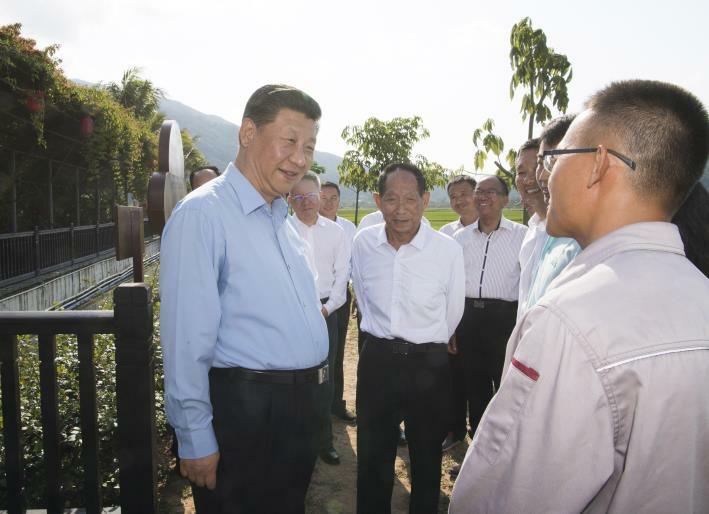 He urged Hainan to implement a more proactive opening-up strategy, speed up the establishment of a new system of an open economy, and promote the formation of an all-around new pattern of opening up. Official figures show that in the past five years, the province's GDP has increased by an annual average of 8.1 percent to 446 billion yuan ($71 billion) in 2017. Since the 18th CPC National Congress in 2012, the number of tourists visiting the island increased from about 33.2 million to 67 million in 2017. Urban residents have seen their incomes rise by 9.6 percent every year. For rural residents the increase has been 11.7 percent annually. By hosting a series of diplomatic, economic and cultural gatherings, Hainan has gained international fame. Xi's four attendances at the Boao Forum for Asia (BFA) Annual Conference since 2010 have been a major highlight, including this year when he delivered a keynote speech at the BFA Annual Conference 2018, vowing greater nation-wide opening up. These events have served to raise the island's profile and expose the province to the cutting edge in business practices and pioneering services. On April 14, the State Council officially released the guidelines for the comprehensive and deepening reform and opening up in Hainan in various sectors, including tourism, medical care, education and sports. In response, shares of many Hainan-related companies rose on April 16. A total of 20 Hainan-related companies reported price increases, with 17 of them soaring to the daily 10-percent limit. Analysts from major securities expressed optimism in the future of the island. According to Hua Chuang Securities analysts, there are a number of important port cities in Hainan which could help the province achieve rapid development in terms of logistics, transportation and services. Tourism, as a pillar industry in the province, has great importance, Xi said while announcing a series of favorable tourism policies aimed at making Hainan an international resort. Efforts include major infrastructure projects like international routes and airlines, and intelligent and network infrastructure. In order to develop Hainan into an international hub of tourism and consumption, the government will open up a duty-free policy to boost sales. Xi also called for new tourism programs and better services. Even though the island has long been a favorite destination for travelers, it has suffered from "growing pains" at the same time. To provide better services and create an excellent environment for tourism, various measures have already been taken by the province. In 2015, Sanya, a major destination in Hainan, set up China's first tourism police patrol to maintain order in the tourism sector. The services of the police include answering queries, resolving disputes and cracking down on crime. Police officers are trained in foreign languages to better help overseas tourists. In addition, Sanya tourism authorities published a document in 2017 soliciting information regarding fraudulent schemes that target tourists, offering whistle-blowers rewards of up to 150,000 yuan ($22,530). The opening up in the medical and education areas has also sped up. With the threshold for imports of medical equipment and pharmaceuticals lowered, foreign doctors can now extend their practice. In March, a new hospital opened in the Hainan Boao Lecheng International Medical Tourism Pilot Zone, which is expected to be one of the first hospitals in China to provide the 9-Valent HPV vaccine. In addition, the introduction of high-quality educational resources to the island is also being encouraged. To keep up with the rapidly increasing tourism on the island, direct flights between China and Mexico were launched on March 21, the first nonstop flights between China and Latin America. Currently, there are 57 international air routes connecting Hainan with the rest of the world and the number is expected to increase to 100 by 2020, according to a report by Xinhua News Agency. In 2017, the international airports in Haikou, capital city of Hainan, and Sanya received over 40 million passengers. Shopping has become another attraction for tourists since a duty-free program was introduced to Hainan in April 2011. Non-locals are allowed to buy duty-free products worth up to 16,000 yuan ($2,553) a year when taking a flight or train off the island. This has proven to be an important driver for the island's tourism industry. The provincial finance bureau announced in January that the offshore duty-free shops on the island have made 30.59 billion yuan ($4.77 billion) in total sales since the program was launched and the average duration of tourist stays has increased by 0.6 days. The duty-free shops can also benefit domestic goods sales in China, as Wang Xingbin, a professor at the Beijing International Studies University, affirmed. "Now most of the products in the duty-free shops in Hainan are foreign. In the future, we can put more domestic brands in the shops." According to the guideline released by the State Council, horse racing is now being encouraged on the island. Hainan explored developing horse racing back in the 1990s, but gave it up because of lack of policy support. "Horse racing will be a strong support to tourism," said Lin Xianpeng, a professor at the Beijing Sport University. "If it proceeds well, it can be a model for other places in China aiming to promote this sport." Analysts said that horse racing and large international sporting events could be two areas likely to see rapid development following the announcement of the government plan on expanding opening up. In addition, cruise tourism is expected to grow as Hainan continues to serve as an important hub along the 21st Century Maritime Silk Road, a major part of the Belt and Road Initiative. Official figures show the Chinese cruise market has grown rapidly in recent years and the country has become the world's second-largest market for cruise travel after the United States. The former National Tourism Administration said China is expected to transport 150 million Chinese tourists, who will spend $200 billion in Belt and Road countries during the 13th Five-Year Plan (2016-20) period. In return, China will attract 85 million tourists from Belt and Road countries, bringing in about $110 billion in tourism revenue. In the 1990s, Haikou became the first city to introduce cruise tourism and established a cruise port. But compared with other coastal cities in China such as Shanghai and Tianjin, this industry has not grown in Haikou. In 2006, Sanya Phoenix Island International Cruise Terminal was put into operation. Now the second phase of this terminal is under construction in Sanya. Once completed, it will be the largest cruise terminal in Asia. "The pleasant climate and unique geographical advantage of our terminal has brought in many cruise fans," Zeng Xianyun, the terminal's president, said. "We hope to make it a world-class cruise terminal that will be a model for China's cruise tourism industry." Liu Xiaotao, Deputy Director of the Coastal Defense and Port Office of Hainan Province, said that by 2020, there will be five towns with substantial cruise travel in the province. "Cruise tourism has become a new emerging industry with great potential and strong local characteristics in Hainan," Liu said.